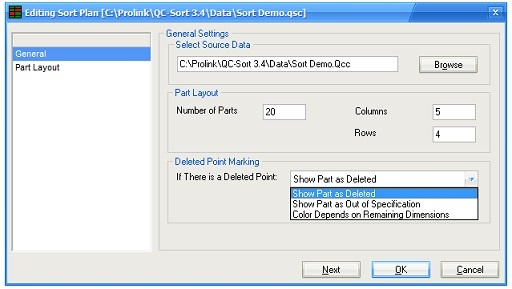 QC-Sort's major strength is it's ability to look at multi-part fixtures, determine the bad parts, and show you graphically which one are bad. In order to do this, all you have to do is create a Sort Plan. Simply point your Sort Plan to a QCC file, tell it how many parts to look at and specify the general layout of your fixture. 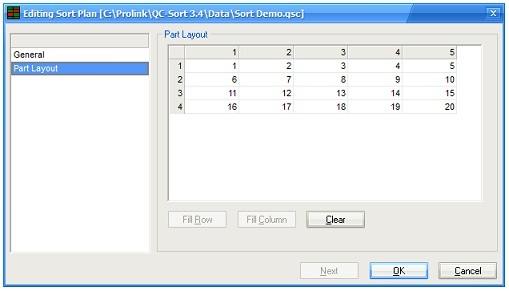 To the right is an example where QC-Sort will view the last 20 parts in 5 columns and 4 rows. In the following screen, specify how the parts are literally laid out (shown at bottom right). For instance, they may be numbered in rows going from left to right or they may be numbered in columns going top to bottom. There are handy Fill buttons at the bottom to automatically fill the rows or columns as you go. Once you've specified the layout, you're ready to measure. Measure the parts in your fixture and collect the data in QC-CALC. Then watch as QC-Sort displays the bad parts. Pull out the red ones and send for rework. Need to measure less than typical? No problem! Simply choose Partial Run from the Tools menu and type the number of parts you will be measuring. QC-Sort will automatically adjust for the next run only and then return to normal.